At the Council of Bishops of the Russian Orthodox Church Outside of Russia of September 13th/26th 1974, the following decision was enacted: To task the Synod of Bishops to send out for guidance the direction contained in the decisions of the Council made on October 13/26, 1953. It was decided: To issue the following direction to clergy, which are necessary for their guidance, but not to publish it. Under no circumstances should heterodox priests be allowed to co-serve in any form, and one should not stand vested at their services. 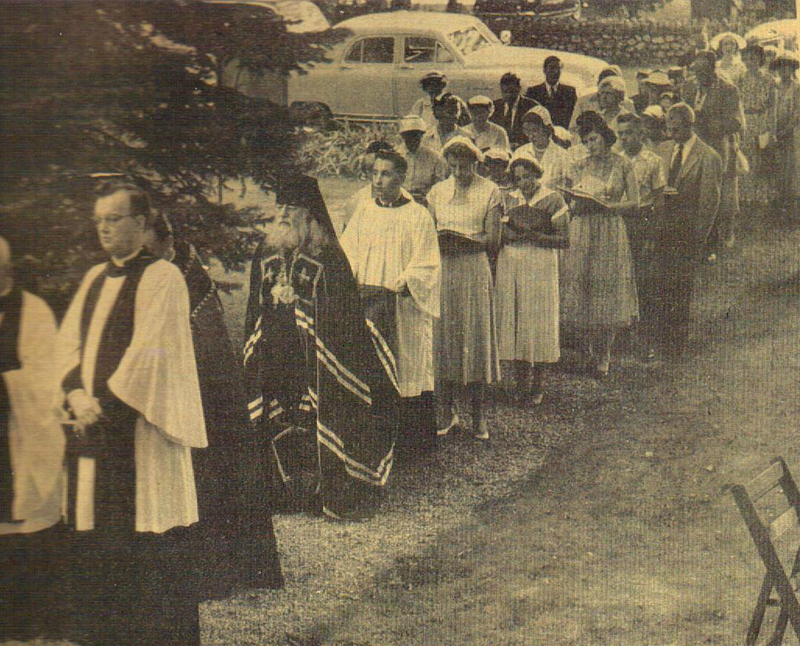 If a heterodox priest, who is present in a neighborly spirit at a celebration in an Orthodox church, puts on vestments, the rector should, through the warden or someone else, ask him to take an honorable place somewhere to the side, away from the serving clergy, so that no one could get the impression that co-celebration is taking place. 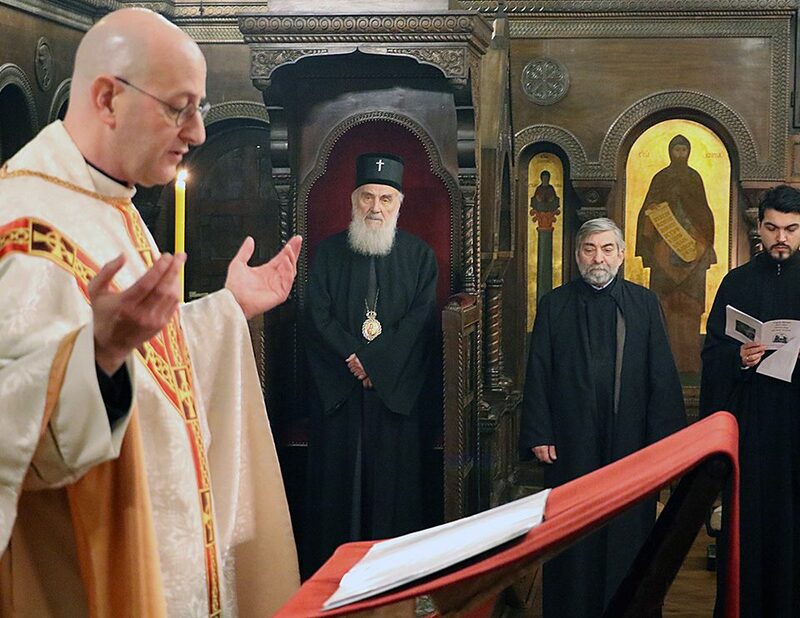 An Orthodox priest who is present at a heterodox gathering should rise when prayers are read, but he should not participate in those prayers or cross himself. If an Orthodox priest is asked to bless the food at such a gathering, then he should do so, since he would have had to read prayers before the meal and bless the food for himself anyway. It is permitted to read prayers for the start of a good deed at joint meetings of Orthodox and heterodox charitable committees. Under no circumstances should priests or parishes become members of local so-called Church Councils. 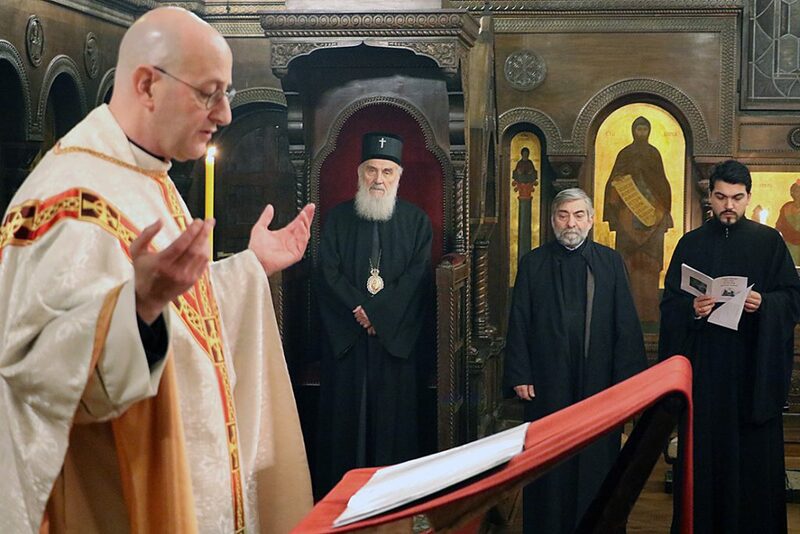 If local Protestant clergy periodically gather to discuss dogmatic issues or issues of pastoral practice, participation in such meetings is only permitted for priests who have sufficient theological preparation to convincingly explain Orthodox teaching. This is permitted only for priests who, having the above-mentioned preparation, receive a specific blessing for this from their diocesan bishop. One must avoid organizing any meetings on YMCA premises and protect one’s flock from any influence of that organization. In the same way, pastors should keep track of those who join this organization and exhort them to leave it, even at the cost of having to suffer all sorts of trouble. Those who are obstinate should not be allowed to approach Holy Communion, and it should be pointed out to them that participation in Masonic lodges is forbidden not only by the Russian Church, but by Greek churches, and that even the bishops of the American Church, currently led by Metropolitan Leonty [Turkevich, d. 1965], who are generally liberal, have issued similar direction. Pastors should by various means exhort their flock not to enter into mixed marriages. They should make it clear to them that a marriage in any heterodox church is not recognized as valid by the Orthodox Church. The latter allows mixed marriages only in those cases where the heterodox person intends to join the Church in the future or, at the very least, promises in writing to raise the children of the marriage as Orthodox within Orthodoxy. If these conditions are refused, the priest must decline to perform the marriage. In such a case he should not be present at any heterodox marriage service or wedding reception, and should not agree to serve a moleben. Under no circumstances should heterodox be permitted to serve as sponsors at baptisms. It should be pointed out that godparents are responsible for raising the baptized person in Orthodoxy, which is something that cannot be expected from a non-Orthodox person. It is permitted to cooperate with non-Orthodox organizations on practical matters, such a change of location or charitable work. However, Orthodox parishes should in no way become part of such organizations. The receipt of financial assistance from non-Orthodox religious organizations should be avoided. Those church organizations that have continued to receive such assistance should gradually look for other sources of support in order not to be dependent in any way on heterodox. This must be done gradually and tactfully in order not to offend one’s benefactors. Putnam County Press, September 17, 1953, p. 6. ROCOR was never a True Orthodox Synod at any point of its existence. 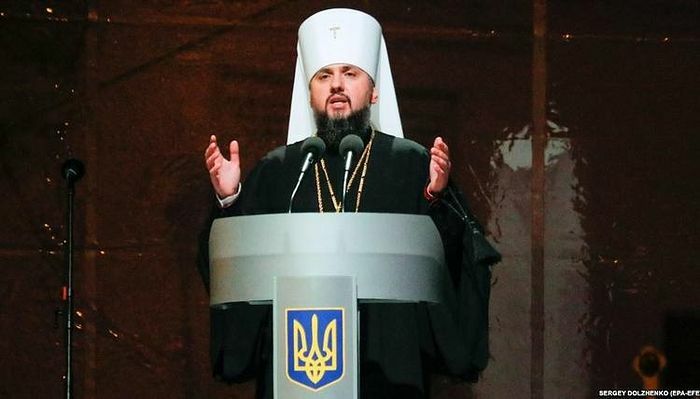 It’s documented fact that Mets Anthony, Anastassy, Philaret, Vitaly along with prominent hierarchs like Abp Averky participated in ecumenical activities that would’ve gotten them condemned by the True Orthodox. Vl Seraphim, pictured above in a procession with heretics in his mantia, co-consecrated a hierarchy for the GOC with a New Calendarist. If you take ROCOR and the Florinites out of True Orthodox History you must ultimately conclude that True Orthodoxy is a brand new religion. Of course they can’t be removed from True Orthodox history. However, as you are well aware, ROCOR certainly NEVER conformed to the ecclesiology established by True Orthodox. It’s not my intention to say that True Orthodox ecclesiology is incorrect. My point is that Church history demonstrates that ecclesiology is more complicated than certain Trues would like it to be. To be honest, the True Orthodox never did a very good job establishing a different “ecclesiology”, and that might be because of the assumption that they had no intention of diverging from standard Orthodox ecclesiology. It was their response to what they perceived as the damage to standard ecclesiology and more that drove their motives. I would say that True Orthodox in general (with a few exceptions) have a far better understanding of Orthodox ecclesiology in the context of history. “You are all schismatics outside communion with ‘the Church'” in a time of global heresy and spiritual crisis is not only a poor answer, but almost always historically the answer of those in the wrong. Now there are some True Orthodox (hoping to establish themselves as the ONLY True Orthodox in the world) who minimize these deviations from the norm among True Orthodox, or deny them altogether in the hope of shrinking the size of True Orthodoxy to their own tiny elder cults. But that isn’t the norm, nor does it usually survive more than two generations. 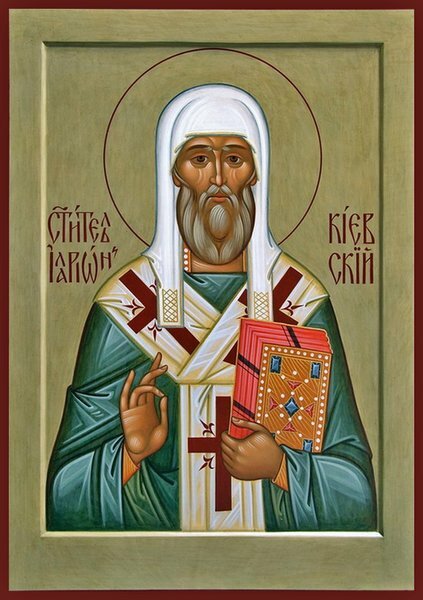 As far as I am concerned, ROCOR, particularly under St Philaret, not only as a whole behaved in a True Orthodox manner but were great protectors of Orthodoxy until their capitulation and reduction to a tiny branch of the Moscow Patriarchate (to even the embarrassment today of clergy of the MP!) in 2007 and beyond. They were not perfect– but no one was. And that was never the point. I’m not trying to debate you on this. 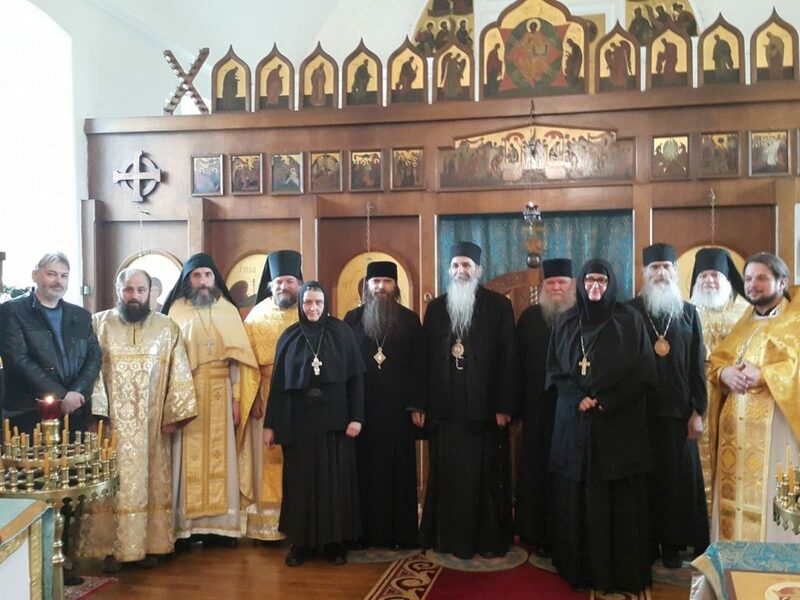 But, it’s not hard to find explicit evidence of the ROCOR Synod and her hierarchs engaging in ecumenical activities that would earn an anathema from True Orthodox. Plus, they were in communion with World Orthodoxy in some form even under sainted Met Philaret. History is rarely written by winners or losers. It is written by survivors, and then further down the line, people check their work. It’s how NFTU’s Hieromonk Enoch was able, after manuscript review, to realize that the alleged 7th century “Spanish interpolation” of the filioque was in not grounded in fact, but later, 11th century mythology. Facts, especially among the living, are often debatable subjects because there are questions about which facts are real. 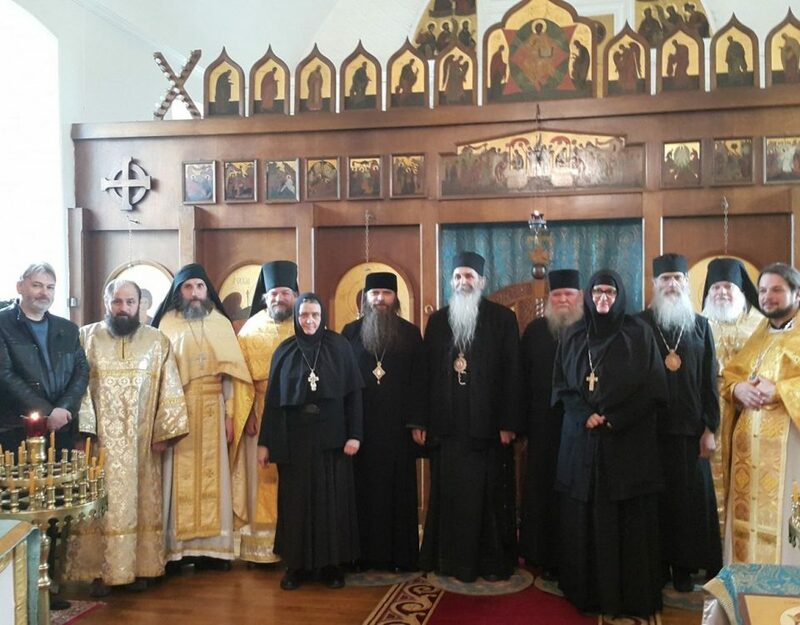 Let me give you an example, a couple of months ago, Metropolitan Jonah presided over the 40th anniversary of a priest’s ordination in New England. Not going to mention his name– it isn’t important unless you are desperate to know– because there is nothing of great interest in the article. But what would you say if I told you that out of those 40 years, the parish priest was involved in two schisms of ROCOR clergy– indeed, almost a “ringleader” of same? You won’t find it in history books (unless you’re looking for his name) and he probably won’t tell you unless you ask. I am old enough to remember the uncomfortable period betweeen 1994 and 2001– in fact I was catechized in ROCOR during this time– where ROCOR was in communion with the Synod in Resistance (which no longer exists, on paper anyway) and Old Calendar Romanians and Bulgarians, who are now in communion with Metropolitan Agafangel and the GOC-Kallinikos. Now, at that time, ROCOR was a confused mess– the binds that held it together for so long were starting to wear thin. You could find ROCOR priests who considered themselves to be actively part of the “World Orthodox” community, and some who could barely stand to attend “Pan-Orthodox” gatherings even when the Serbs were hosting. Yet the truth is that this discomfort existed in the 90’s, the 80’s, the 70’s, the 60’s…. So a binary answer is not helpful nor logical. “No, ROCOR was not True Orthodox.” Yet She continued to make and assist True Orthodox bodies, not just in Greece, but in Russia until 1994. Keep that in mind. 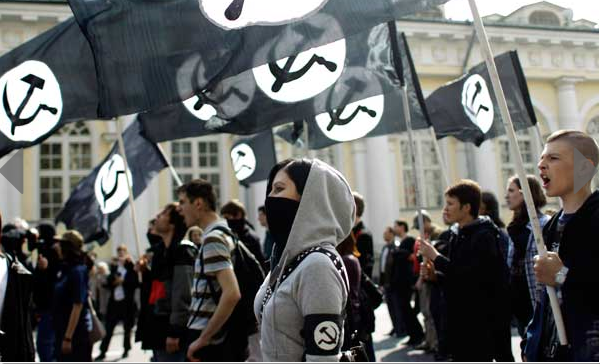 In 1994, this was still happening under Metropolitan Vitaly. Some say it precipitated the schism between the groups– who knows? What I do know is that there are people today, who consider themselves in ROCOR, in many different organizations, who held a firm commitment to protecting Orthodoxy, which is the whole point of True Orthodoxy anyway. And if you study ROCOR’s history vis-a-vis True Orthodox history, without polemic, and look at the names and the history carefully, you will find that there are fewer easy answers than you’d expect. But the great reward you will receive is that you will be able to understand that even a relative nobody can struggle mightily against the heresies that affect our day and find saving relief in the bosom of the Church. But that safety is found in Her teaching and practice: perhaps not among every Bishop, but there are still enough– if you seek out holiness and Orthodoxy, you will find it in good time by God’s grace. It’s when we stop asking questions, when we get comfortable, that we begin to make excuses, even for ourselves. Happy feast of St Cuthbert of Lindisfarne!